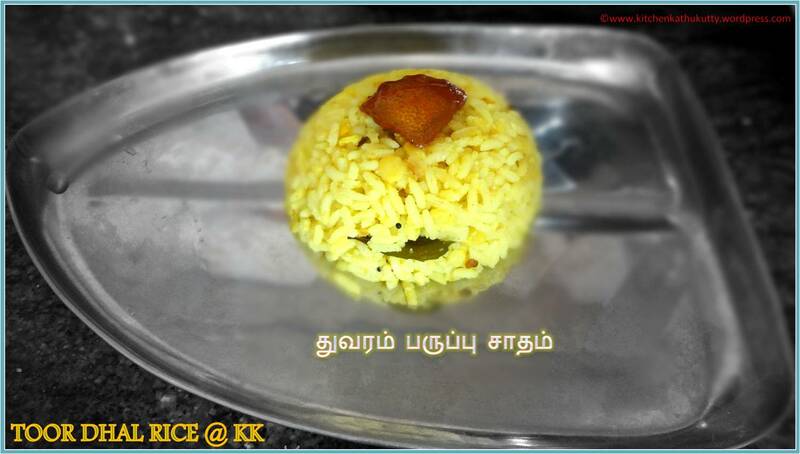 A very yummy and simple side dish for rice. 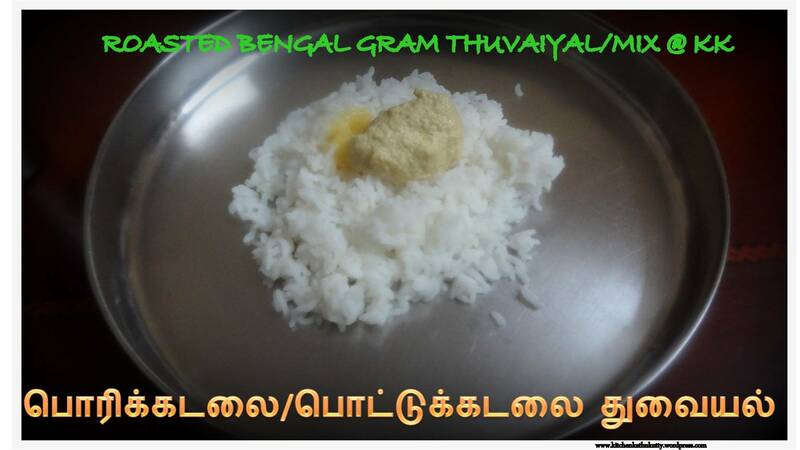 It is heavenly in taste when it combines pure ghee and hot steaming rice. In our family we have the habit mixing rice with this along with sothi/vendhaya Charu/puli kulambu. Have a try and let me know your feedback. Infants above 1 year of age can also be given this. 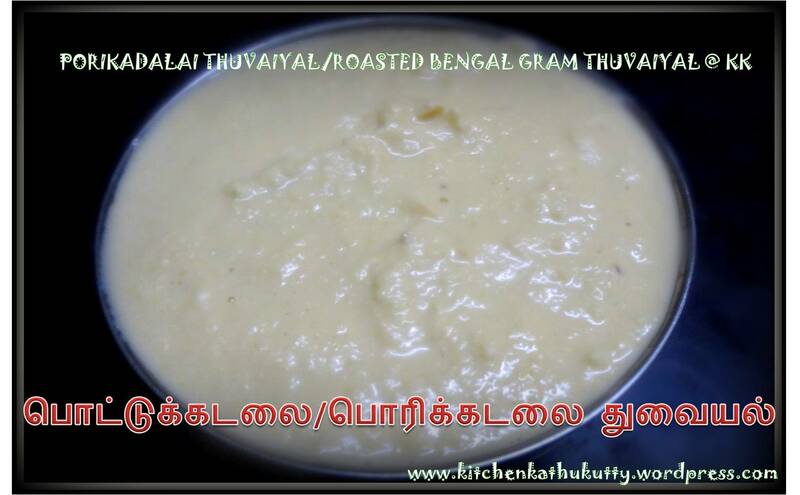 In a mixer jar add roasted/fried bengal gram,garlic,grated coconut and green chilly. Blend it into a coarse powder without adding water. Sprinkle little water now,add salt and make it into a thick paste. You can also have this as a smooth paste. Be careful while adding water. This can be added to rice for your baby. Reduce the spice level and skip adding salt in that case. A favourite dish of the family for around four generations. A very simple and easy to do recipe. When the oil turns golden brown add hing and turmeric and give a quick stir. Add around half cup of water and let it boil. When it begins to boil add the tamarind extract and let it boil. This recipe would be hopefully very new to most of you.This will be an excellent side dish to idly. Your morning cooking will have a change with this dish.People who wish to avoid coconut chutney can very well go with my recipes of khicidis. Wash,peel off the ridge gourd skin and cut them into small pieces. In a kadai,add oil and temper with mustard seeds,urad dhal and curry leaves. Add green chilly,onion and chopped ridge gourd and saute them well. Add hing and turmeric powder and give quick stir. Add water and let the ridge gourd cook. When the ridge gourd is cooked 90%,add tamarind extract and salt. Let it boil and stop cooking when it reaches sambar consistency. Serve it hot with idly. You can add more chillies to adjust your taste. To cook ridge gourd soon,you can grate them and cook it in idly cooker before sauting. Aapam occupies our family breakfast definitely when guests arrive. 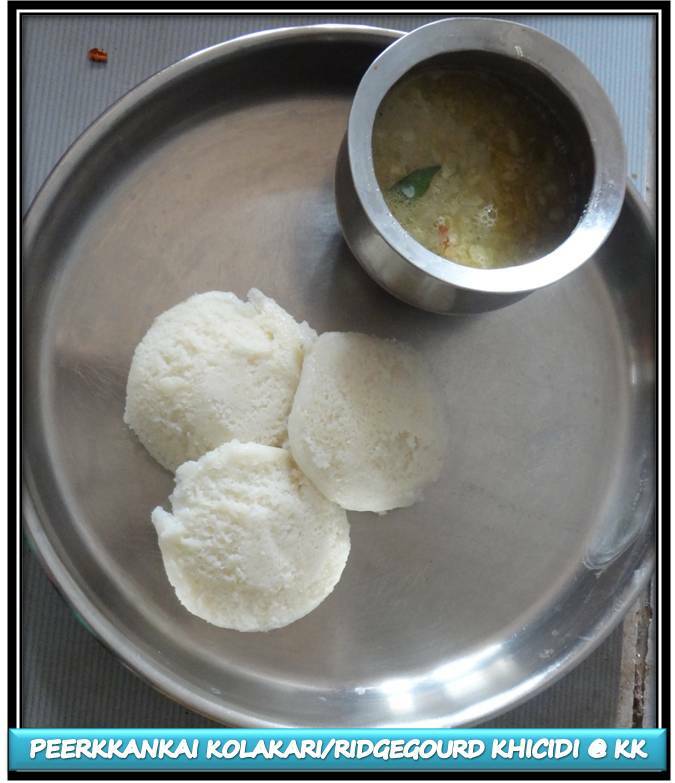 But post wedding aapam has become one of the very common dishes and Niranjan loves it 🙂 As all three of us have no capacity to bare the stomach pain after having aapam made with cooking/baking soda we found this recipe to make aapams from mom. And Hubli temperature absolutely cooperates for the below process. Soak urad dhal and fenugreek seeds together. Soak it for a minimum for 4 hours. Grind urad dhal and fenugreek seeds into a fine paste without adding much water. Grind both the rice together in the same format. Mix both the above ground batter well and let it ferment for 8 hours. The batter would have risen up if fermented well. Mix it well after you confirm it is fermented well.Now the batter is ready for use. To make aapam,take a mixing bowl and add required batter to a mixture of salt and water. 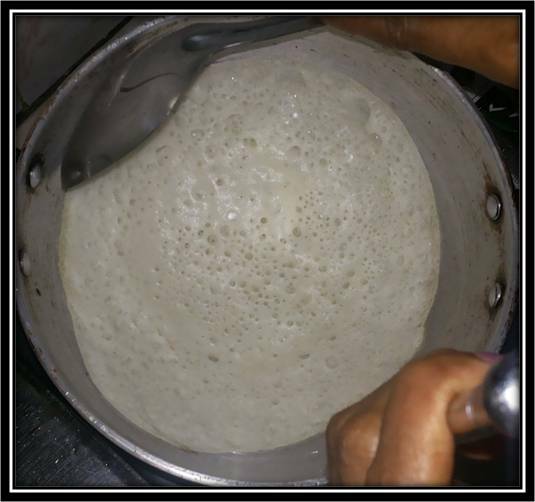 Dilute the batter to slightly thinner than dosa batter consistency. Heat the aapam kadai and grease with little oil the entire curved surface. Now add a ladle of batter and spread it across the kadai. Add little ghee in the corners and close the tava. You will find millions of dots/holes(see below pic) as the aapam gets cooked. Carefully remove it from the kadai by taking it from the kadai from corners of the aapam. The best/traditional combination in our family is sothi or plain coconut milk with grated jaggery or onion chutney. You can also add grated coconut while grinding the rice. While diluting the batter you can add coconut milk instead of water to enrich the taste. Dilute only the amount of batter required for making aapams. You can store the remaining batter in refrigerator for a day. Grind the rice,dhals,fenugreek into a very fine and thick paste to have fluffy and smooth aapams. Infants who are 8 months and above can be given this twice week by soaking well in sothi/coconut milk. If you make it infants do not store and use. I am adding 2 pictures below to make you believe that aapam can be made without cooking soda as few doubt that the aapam will lack fluffiness and it might stick to the kadai. I have always used and had capsicum as a part of chinese dishes only mostly. For the very first time , my husband gave a clue on this capsicum sambhar. With few tips from my MIL and continuous trial and error we arrived at this yummy sambhar. My husband loves this and will definitely demand for more rice with this. Wash both the dhals in water and soak them for few minutes. Pressure cook both together and mash them once cooked. In a kadai , add oil,make mustard seeds spulter. Add fenugreek seeds,curry leaves,red chilly. Saute onion,tomato and capsicum one after the other. When they turn soft add hing,turmeric powder,sambar powder and give a quick stir. Add water and let capsicum cook. Now add the cooked dhal and let it boil for few minutes. The more the sambhar boils,the yummier is the taste and flavour. You can add chilly powder instead of red chilly. You can add tamarind extract and let it boil after adding mashed dhals. Adjust the level sambhar powder according to your spice level. I like it when it is slightly thicker than usual sambhar. 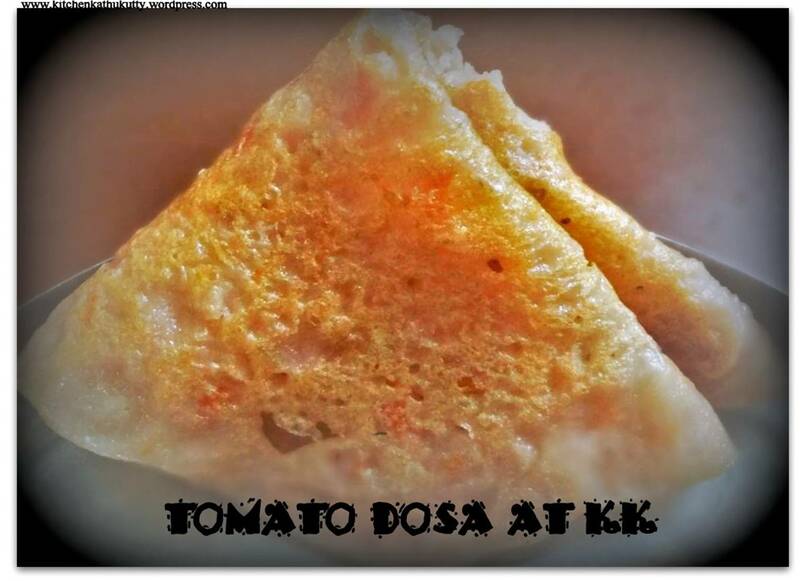 An easy instant dosa variety which can be prepared in a matter of 15 minutes. Add salt to water and mix it well. Add wheat flour slowly to this water and mix well. Add chopped onion and green chilly and mix well. 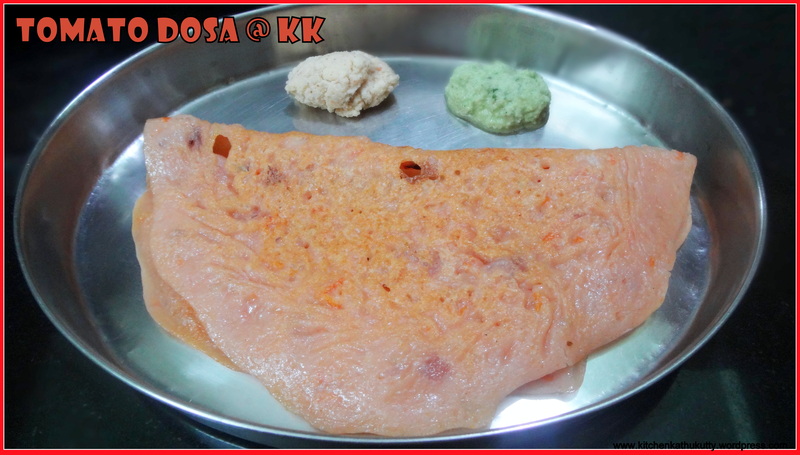 Grease a dosa tava , spread the batter evenly to make a dosa. The same procedure can be followed by adding the flour to left over dosa batter. Adding a spoon of rice flour gives a crispy taste. Coconut/tomato chutney makes a good combo. Coriander leaves and curry leaves can also be chopped and added to enhance the flavour. This is one of grandma’s recipes which each of us in the family would love to be cooked by her.A very easy one pot meal which I would recommend for working mothers and even bachelors. 1.Wash rice and dhal and soak them for 10 minutes. 2.Grind coconut and cumin seeds and set it aside. 3.Soak tamarind and prepare half cup of tamarind extract. 4.Add oil in a kadai and temper with mustard seeds,urad dhal. 5.As it splutters, add shallots,garlic,red chilly and saute well. 6.Add rice,cooked dhal,the coconut cumin seeds paste and all prepared in step.5 in a vessel in pressure cooker. 7.Add turmeric powder ,salt and pressure cook with 1/2 cup of tamarind extract + 1 and 1/2 cups of water. 8.Once pressure cooked,mix well and serve it hot. Adding onion vadagam will add more taste. The ratio of tamarind extract:water is 1:2. 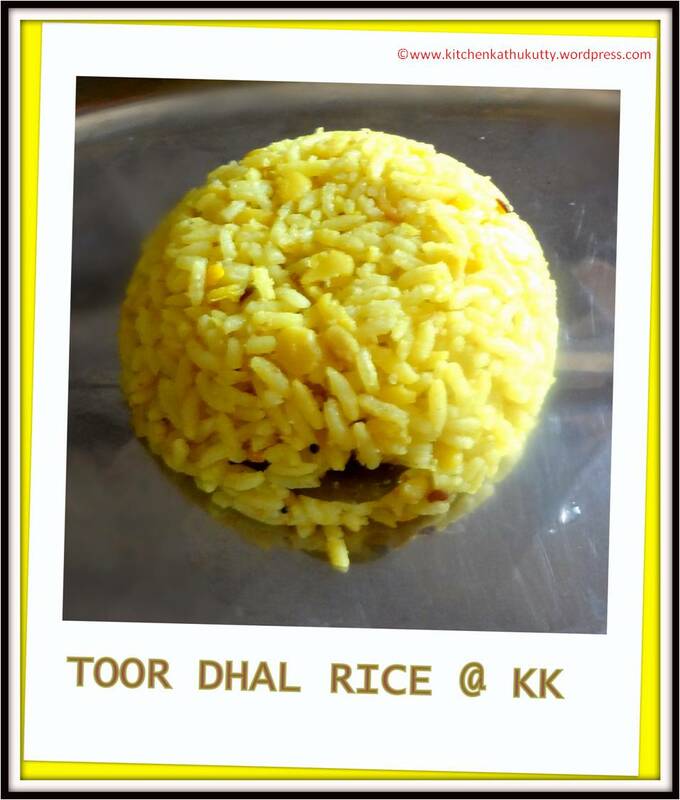 In step 6,you can also add toor dhal,rice,turmeric powder and saute before pressure cooking. You can also pre cook dhal separately. This goes well with any deep fry or vathal/vadagam or pickle. Peel and grate bottle gourd; do not squeeze out water (juice) from grated bottle gourd. Grind red chilly first and add grated coconut, soaked rice and grind it to a coarse paste by adding enough water. When the rice is ground to 3/4 th add grated bottle gourd n grind into a smooth paste. The consistency should be as that of dosa batter. Add salt,chopped onion,curry leaves and coriander leaves to the batter and mix well. Serve it hot with coconut chutney. Choose a fresh and soft bottle gourd. Adding green chilly instead of red chilly will give a different colour and taste. Cook one side by closing and turn the dosa and cook. Cook it in slow flame. Be careful in adding water. Do not squeeze out the juice of bottle gourd. Adding coconut is purely optional. Wash and soak the rice,dhal and red chilly for a minimum of 3 hours. Wash tomato thoroughly and finely chop them. Grind the soaked rice,urad dhal and red chilly without adding water. When the rice is coarsely ground add the chopped tomatoes. When there are no coarse particles left,you can switch off the grinder/mixer and transfer it to bowl. Add some water and make the batter slightly flowing. Add chopped shallots and salt to the batter. Heat dosa pan and spread the batter to make dosa. Close the dosa pan with a lid and steam cook dosa on first side. Turn sides and cook the other side. The quantity of tomato depends upon your taste and sourness of tomato. Adding “Naatu Thakkali” would enhance the taste of dosa. Onion Chutney/Coconut chutney would be a great combination. Making dosa immediately after grinding is preferred. 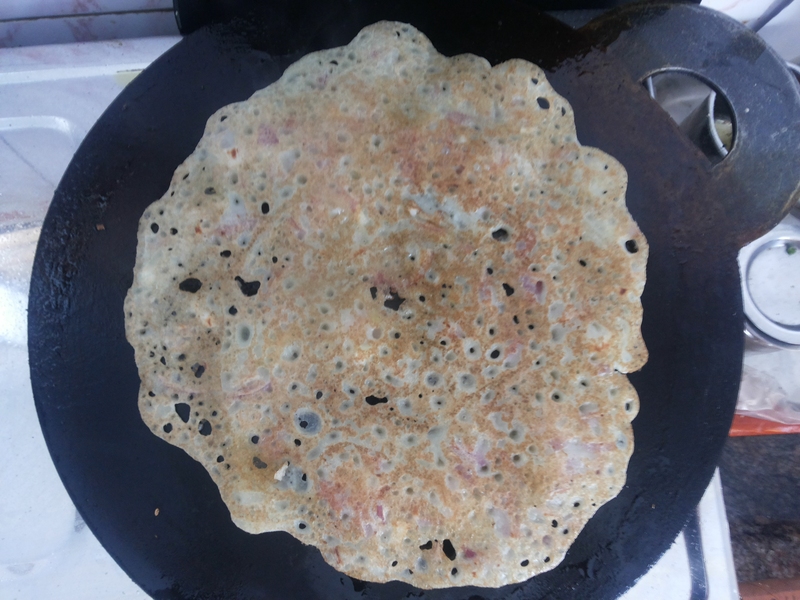 If you would like sour taste,leave the batter for 2 hours before making dosa. Water has to be added very carefully. Don’t make it runny as the dosa would stick to the pan. 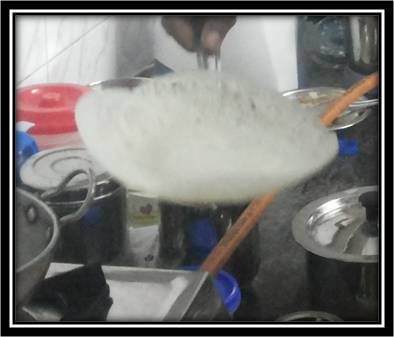 The dosa has to be cooked with one side closed and then turned. Slow flame is advisable. When you make this for babies less than 1 year,skip salt. This was the first sweet which I had tried post wedding. By God’s grace it came out so well. A very simple and easy to do sweet,but very yummy. Wash the carrots thoroughly and peel the skin. Grate it using a fine grater. Heat ghee in a kadai and carefully roast cashew nuts and raisins. Separate them. Boil milk and cool it. I prefer boiling before using for halwa to check the goodness of the milk. Add and heat remaining ghee in a kadai and add the grated carrot to it. Saute the carrot until the raw smell of carrot vanishes. Add milk and allow it to boil. Keep continuously stirring from this stage. When milk begins to boil,add sugar and keep stirring. You will find that the mixture thickens. Cook until the mixture thickens and attains the consistency of halwa. Add roasted cashew nut and raisins . The more the amount of ghee,the more yummy the halwa is. If you wish to add few strands of saffron,soak it in little quantity of warm milk and add before step 10.